• Full name: InstyMeds Corp.
• Based in: Eden Prairie, Minn.
• Founded: 10 years ago. • To date: Has filled 2 million prescriptions. • To use a machine: One must be a patient at a health care facility with a dispenser. TEMPE – Arizona State University students who are tight on time and limited on transportation will often get their calories from a vending machine. Now they can get their medication in much the same way. 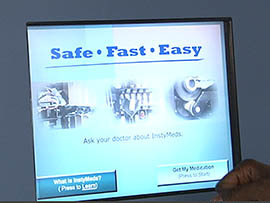 The InstyMed machine at the Tempe Health Center is the first in Arizona, and ASU is only the second university in the nation to use the system. It replaces a pharmacy operated out of the health center. Student Brady Welch said he’s excited about the prospect of using a medical vending machine rather than a pharmacy. Not all medications will be available for vending. For example, ASU’s machine won’t offer prescription narcotics. Robert Bang, InstyMed’s vice president of client services, said the organization that houses the machine gets to choose which medications are dispensed. Christiana Moore, associate director for ASU Health Services, said that when considering which medication to dispense a committee analyzed the most frequently prescribed medications. “We’ve worked to look at a list of top medications that are supplied in our clinic and have that available within our machine for students,” she said. Moore said Health Services will focus on urgent care medication and offer a variety of over-the-counter medication available as well. As for narcotics and other prescription drugs not available in the machine, ASU is working with area pharmacies, she said. Students can pay for vending machine medication with their insurance, a debit card or a credit card. IntsyMed is also working with ASU to allow students to charge the cost directly to their ASU account, though that isn’t yet an option. Moore said medication will be available any time the lobby is open. For example, students can fill their prescription at the InstyMed machine on Saturdays, when the pharmacy used to be closed. Bang said that greater access doesn’t necessarily mean a decline in security. “It is a 1,500-pound machine, it is armored and it is on a continuous link to our customer service. So we’re constantly checking its connectivity and know what is happening with it,” he said. Bang said the process of filling a prescription is also mores secure. Each bottle is triple-scanned. The medicine is scanned when it’s shipped to the machine, when it’s loaded into the machine and when it’s dispensed to the student. “When they write the prescription, it will produce what we call a voucher and it has a code on it. That code is good for one time only for just that student and for just that particular dispenser and only for 24 hours,” he said. “It also provides drug education information through a portal that will provide everything that they need to know about a particular medication, same thing they would get at a drugstore,” he added. Aaron Boyd, a graduate student, said he believes students will gravitate to this system. ASU students on the Tempe campus might use a vending machine to grab potato chips or pop on their way to class. And starting next semester, they'll be able to grab prescription drugs too. Reporter Analise Ortiz tested out one of the new vending machines. 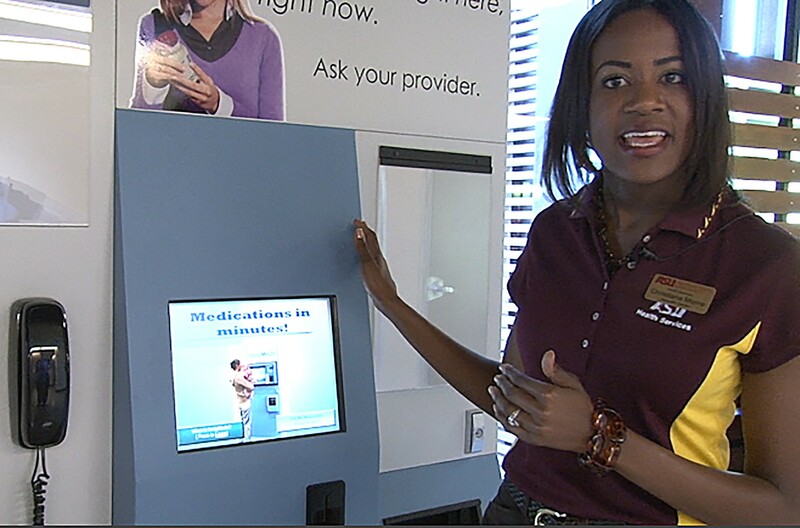 Christiana Moore, associate director for ASU Health Services, said that when considering which medication to dispense through a new InstyMeds vending machine a committee analyzed the most frequently prescribed medications. 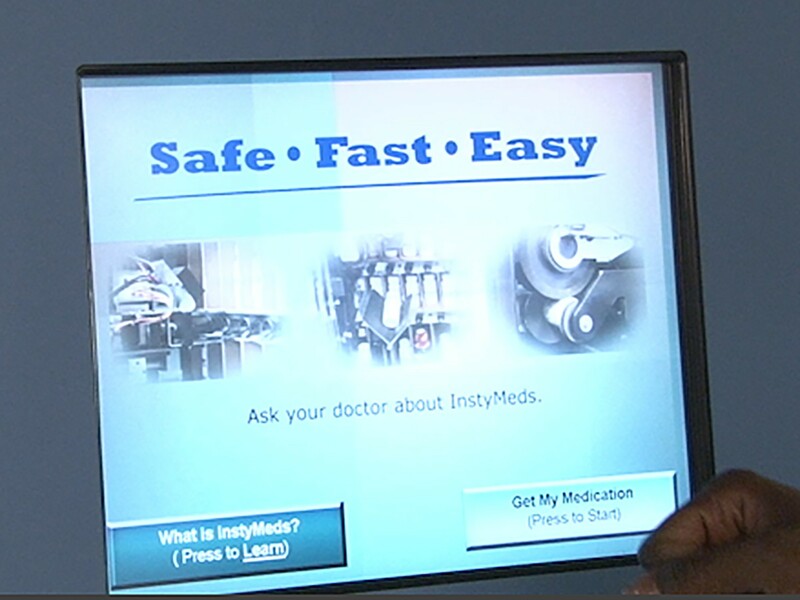 The InstyMeds prescription vending machine at Tempe Health Center is the first in Arizona.